[195 Pages Report] The precision farming software market is expected to grow from USD 463.8 Million in 2015 to USD 1,188.7 Million by 2022, at a CAGR of 14.03% between 2016 and 2022. 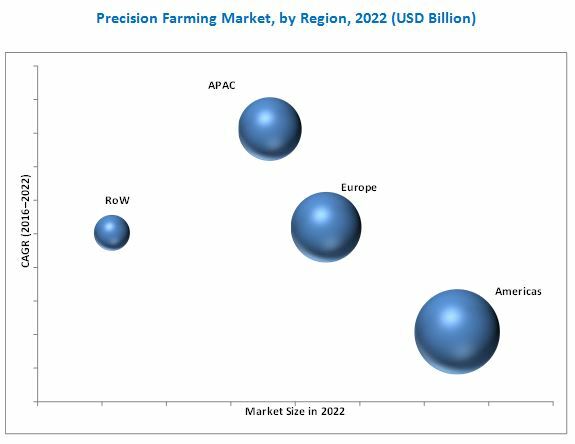 This report provides the market size and future growth potential of the precision farming software market across different segments such as delivery model, application, service provider, and geography. The study identifies and analyzes the market dynamics such as drivers, restraints, opportunities, and industry-specific challenges for the market. This report also profiles the key players operating in the market. The base year considered for the study is 2015, and the market size forecast is provided for the period between 2016 and 2022. This research study involves the extensive use of secondary sources, directories, and databases (such as Hoovers, Bloomberg Business, Factiva, and OneSource) to identify and collect information useful for this study. The research methodology followed in this report is explained below. After arriving at the overall market size, the total market has been split into several segments and sub segments, which was further confirmed with the key industry experts. 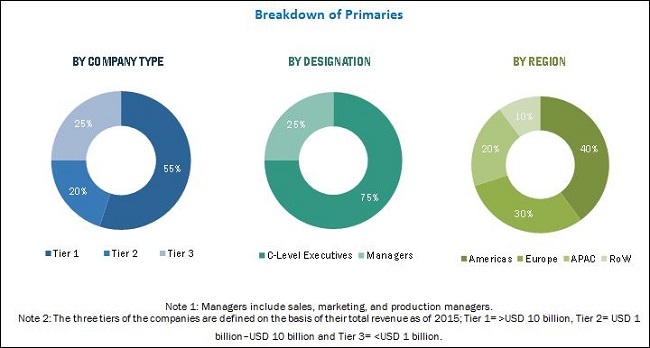 The figure below shows the breakdown of primaries on the basis of company type, designation, and region. The major research and development companies in precision farming software market are Deere & Co. (U.S.), Granular, Inc. (U.S.), Trimble, Inc. (U.S.), and Agrivi Ltd. (U.K.), which develop agricultural software according to the farmer’s requirements. The precision farming software ecosystem includes software providers such as Trimble, Inc. (U.S.), iAgri (New Zealand), and Observant (Australia); service providers; device vendors; farm management software solution and application providers; and end users. Detailed analysis of various delivery models for each country. According to MarketsandMarkets’ forecast, the precision farming software market, in terms of value, is expected to grow from USD 463.8 Million in 2015 to USD 1,188.7 Million by 2022, at a CAGR of 14.03% between 2016 and 2022. Precision farming software is mainly driven by integration of mobile technology with farming techniques, growing use of agricultural software for farm efficiency, and growing demand of real time data management through cloud computing. Other factors such as government’s support to adopt modern agricultural techniques and strengthening of intellectual property rights over agriculture innovations have further contributed to overall market growth. Precision farming software is going to be the modern way of agriculture that people across the world would adopt. The major restraining factor for the precision farming software market is the high initial capital investment. This report covers the precision farming software market based on delivery model, application, services and geography. Cloud based delivery model is expected to grow rapidly between 2016 and 2022. The precision farming software market is divided into two delivery models, namely, on premises, and cloud based. The precision farming software market for cloud based delivery model is expected to grow at the highest rate between 2016 and 2022. The implementation rate of cloud based model is expected to be high compared to on premise model because this model has advantages such as it provides large data storage, facilitate cost saving, and reduce energy consumption. The yield monitoring application is expected to hold the largest share of the market between 2016 and 2022. Yield monitoring is the most extensively used application in precision farming software as it help to understand field variability and helps farmers in maximizing their yields. Yield monitoring provides farmers the necessary information about weather conditions, soil properties, and fertilizers which may affect the overall grain production. Soil monitoring is the foremost application of yield monitoring. Soil monitoring is used to detect soil parameters that are needed for an efficient yield production. Weather tracking & forecasting application is expected to grow at highest rate between 2016 and 2022. Weather tracking is one of the important parameters in precision farming as it facilitates up-to-date information of prevailing climatic conditions, such as temperature, rain, wind speed and direction, solar radiation, and so on. Weather tracking helps make decisions before severe and potentially dangerous conditions occur, thereby protecting a farmer’s family or business. Weather forecasting predicts the probability of precipitation, amount of cloud cover, and maximum or minimum temperatures. The growth is attributed to the increasing awareness of farmers to get the knowledge of weather conditions to plan their farm operations in advance. In the APAC region majority of crop production is mainly dependent on rains. This factor plays a vital role in the growth of the weather tracking and forecasting application in the market. The precision farming market in APAC is expected to grow at the highest rate between 2016 and 2022. APAC has large farmlands and a high population growth rate. APAC has a huge regional spread, which comprises countries such as China, Japan, India, Australia, South Korea, and Rest of APAC. Moreover, the political support and investment in agriculture by the Asian governments is playing a crucial role in the development of the agricultural market. The Americas held the largest share of the market in 2015. The need for advanced agricultural solutions is expected to drive the growth of the market in this region. The countries in the American region such as the U.S. and Canada are the early adopters of the precision farming technologies, which is the major factor for the high market share of this region in the market. Farmers or growers in this region are increasingly adopting advanced farming systems, farm management software, mobile applications, cloud services, imagery services, and data analytics services. The main restraint for the companies in the precision farming software market are high initial capital investment. The major vendors in the precision farming software market include Deere & Company (U.S.), Trimble, Inc. (U.S.), AgJunction, Inc. (U.S.), and Raven Industries (U.S.) among others. These players adopted various strategies such as new product developments, mergers, partnerships, collaborations, and expansions to cater to the needs of customers. 12.5 SST Development Group Inc.
12.13 Topcon Positioning Systems, Inc.